When Lu Bu attacks a player, they must use an additional escape to stop the attack. When Lu Bu duels another player, they must use an additional attack every round of the duel. When Lu Bu damages another player with an attack, they can allow Lu Bu to take a card from them. They then choose any third player and Lu Bu duels them. 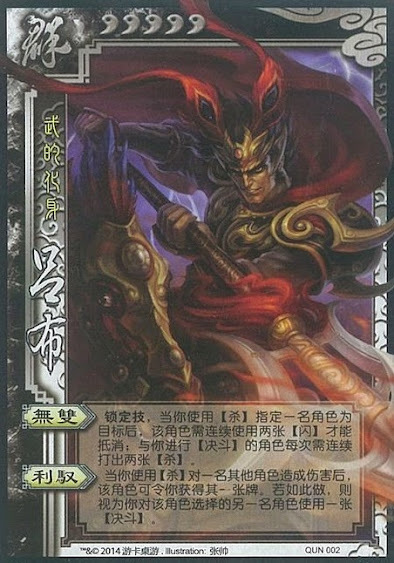 "Matchless" is the same power from the original Lu Bu. The person that Lu Bu damages decides to use "Bribery" or not. Lu Bu does not have a choice in the matter. If Lu Bu damages someone without any cards, they cannot use "Bribery". Lu Bu gets to choose the card he takes with "Bribery". It can be a hand card or equipment. When "Bribery" is used, the target must play the first attack.